On Saturday, April 23, the Coney Island History Project is offering a new walking tour free of charge as part of Immigrant Heritage Week. Coordinated by the Mayor's Office of Immigrant Affairs, the annual citywide program of events celebrates the history, traditions and contributions of NYC's diverse immigrant communities. IHW begins on April 17th in recognition of the date in 1907 when more immigrants entered the U.S. through Ellis Island than any other date in history. The theme for Immigrant Heritage Week 2016 is "From Many, Making NYC One." The Immigrant Heritage Tour of Coney Island is the newest in the Coney Island History Project's walking tour program. The 1-1/2 hour, wheelchair accessible tour explores the contributions of immigrants to the history and development of "The Playground of the World." The tour will also go by stores and attractions operated by immigrants from countries such as China, Mexico and Jamaica who have recorded their stories for the Coney Island History Project's Oral History Archive. The Immigrant Heritage Tour will be led by Amanda Deutch and Tricia Vita, who facilitate and record oral histories for the Coney Island History Project. The April 23rd tour is offered at 12pm and 3pm. Tickets are free but must be reserved online as capacity is limited. If you can't make it to Immigrant Heritage Week, starting in June, the Immigrant Heritage Tour of Coney Island will be added to the schedule of our weekend walking tours, which cost $20. Advance ticketing is available via our online reservation page. If you have a question or would like to schedule a group visit, email events@coneyislandhistory.org. Our unique tours are based on History Project Director Charles Denson's award-winning book Coney Island: Lost and Found, the interviews from our Oral History Archive, and other primary sources. On Thursday, May 26, Mr. Denson will give a slide talk at the Coney Island Library, 1901 Mermaid Avenue at West 19th Street. The talk begins at 6:30pm and is free to the public. "My talk tells the story of several immigrant families who started small in Coney Island and then went on to become enormously successful due to hard work and perseverance," says Charles Denson. "Immigrants like Nathan Handwerker of Nathan's Famous and Denos Vourderis of the Wonder Wheel started with nothing, built successful businesses, and helped to shape Coney Island. Immigrant artisans Marcus Illions and William Mangels brought craftsmanship and artistic experience from their native countries and built factories in Coney Island that produced great works of folk art in the form of carousels and other amusements. 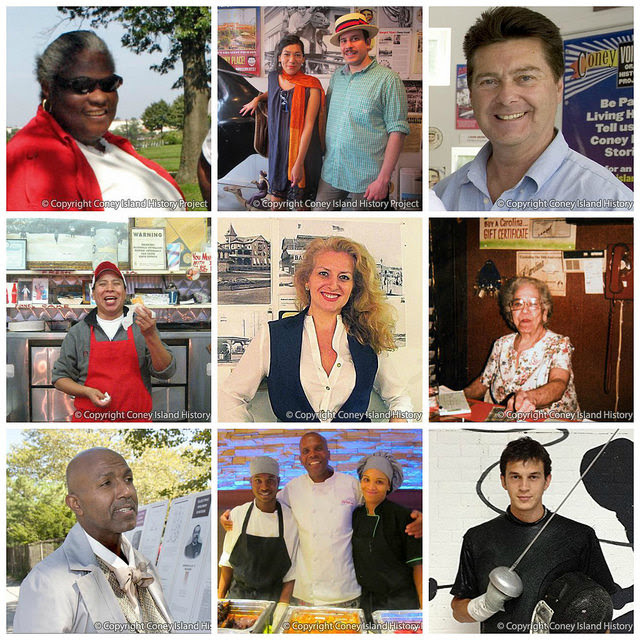 Recent immigrants continue to play an important role in the community." For more than 60 years Jimmy Prince has served as the heart and soul of Coney Island, the real Coney Island, a place of kindness, and respect, and family. He's a man who represents the best that this community has to offer. “Mr. Major” has made a difference in the lives so many people, during good times and bad. It's been a pleasure to work with him for so many years, and to now have him volunteering at the Coney Island History Project. I am also grateful to have had the opportunity to record and capture a critical part of Jimmy's life while filming the documentary, "The Prince of Mermaid Avenue," a film that I would recommend to anyone who wants to know what Jimmy and Coney Island are really about. It's a humbling experience to be sharing the honors with Jimmy tonight and I'd like to thank the Alliance for including me in this event. Congratulations Jimmy! You’re a true saint and we love you! Photo of the Day: 1912 - White House or Bust! Bernie Sanders will pay an historic visit to the Boardwalk on Sunday afternoon. After a rally at 2pm -check-in starts at 11-- he'll participate in the New York electoral tradition of eating a hot dog at Nathan's Famous. Coney Island is a favorite campaign stop for local politicians, but we can't recall a rally by a presidential candidate. 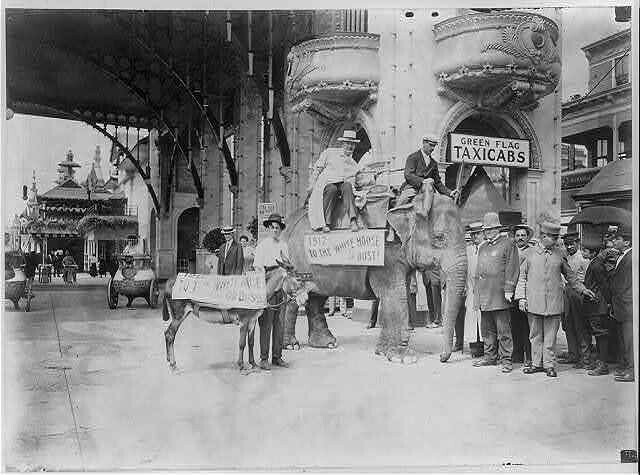 Back in 1911, however, Luna Park staged a race between an elephant and a donkey, from Coney to Washington. "1912--TO THE WHITE HOUSE OR BUST!" There's no record of whether the GOP's elephant or the Dem's donkey won the race, but Democratic candidate Woodrow Wilson beat Republican William Taft and Progressive Teddy Roosevelt in the 1912 election. Among the recent additions to the Coney Island History Project's online Oral History Archive are the following interviews. Please listen, share, and if you or someone you know would like to record a story, either in person or on the phone, sign up here. What better place than Coney Island for a man who floated down the Amazon River in a rubber suit and was the first to swim the English Channel. Craig Boyton Dudley talks about his great-grandfather, Paul Boyton, who built Sea Lion Park, Coney Island's first enclosed amusement park, in 1895. Boyton's Shoot the Chutes was incorporated into Luna Park and operated until 1944. Economic development specialist Georganna Deas is a Coney Island resident and advocate who has lived in the Gravesend Houses on Kaiser Park for 40 years. Among the issues she talks about was getting rid of the smokestacks along Coney Island Creek, challenging the Transit Authority to make Coney Island a one-fare zone, and organizing against the privatization of Coney Island Hospital. Louise Milano shares memories of her mother, Carolina, who operated Carolina Restaurant on Mermaid Avenue for 60 years, and of growing up in a restaurant family. Carrie prepared traditional home style cooking such as breaded baked clams, fried zucchini flowers, and stuffed artichokes with garlic that remains memorable to generations of Coney Island residents. 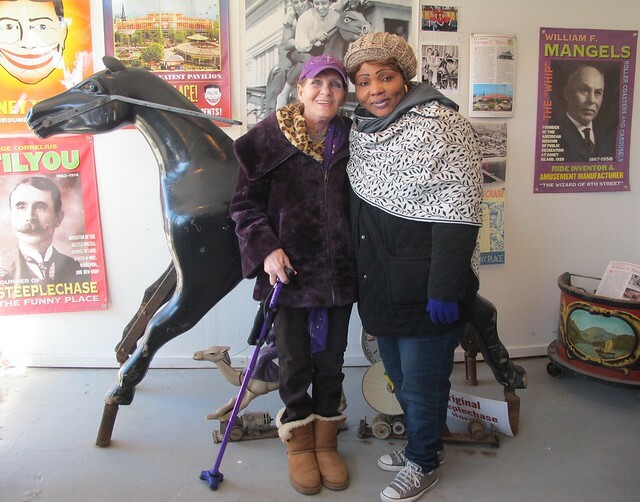 Taty Alicea and her son Ralph Alicea share fond memories of Coney Island's famous Laughing Lady, a popular mechanical attraction that was part of the Magic Carpet Fun House and is greatly missed. Federico Ausbury and Maira Vergara are a husband-and-wife music duo whose band is called A Flying Dodo Society. Last summer, they busked on the Q train and in Coney Island on the boardwalk and the pier. They talk about their journey from Argentina, where Maira is from and they first met, and Puerto Rico, where Federico grew up, to Brooklyn and Coney Island. Ausbury sings one of his new songs, "Coney Island (Shake Your Shoes)," accompanying himself on kalimba. Marina Rubin, the author of Stealing Cherries (2013), reads excerpts from her book of flash fiction, and talks about storytelling, poetry and the Russian Jewish immigrant experience. Born in the small town of Vinnitsa, Ukraine, she immigrated to the U.S. with her family, who sought political asylum and settled first in Bensonhurst and then in Coney Island. David Head is a retired NYC Transit worker and former chairman of the Black History Committee for TWU Local 100. He talks about the accomplishments of Granville T. Woods (1856-1910), an African-American inventor whom he has championed. Among Woods' many electrical patents was one for the world's first electric roller coaster, which was located in Coney Island a century ago. Head was instrumental in having a Coney Island street across from Stillwell Terminal renamed Granville T. Woods Way and wrote a book about Woods' career. Gabriel Valencia lives in Coney Island and has worked at Gregory & Paul's eatery, now called Paul's Daughter, for 20 years. He came to New York from Mexico to join his brother and learned English little by little, by talking with the customers at the counter. Paul Georgoulakos and his family are good people who treat him "like family," says Valencia. He tends the bar at the popular restaurant, which was founded at this location in 1962 and is the oldest on the Boardwalk. Basil Jones is the chef at Footprints Cafe in Coney Island, which specializes in Caribbean cuisine, and is the originator of their famed Rasta Pasta. Born in Jamaica, Jones learned to cook as a boy helping out in his grandmother's kitchen. He talks about his culinary career, from his first job at a hotel restaurant to creating unique dishes for Jamaica's 25th anniversary. A scholarship to culinary school brought Jones to the U.S, where he settled in Brooklyn and developed the original menu for Footprints. Misha Mokretsov, head coach and owner of the New York Fencing Academy in Coney Island, has trained nationally top-ranked fencers in every age group. He says that fencing is an intellectual as well as a physical sport, making it a popular choice of parents and one of the fastest growing sports in the U.S. Among his fencing academy's first students were the children of Russian and Ukrainian immigrants who had fenced in their youth. When weather permits, the students do physical conditioning on Coney Island's beach. One of the first photos inside‪ the Art Deco ‎Coney Island‬ ‪P‎umping Station‬ since it was sealed up decades ago was taken today by Coney Island History Project director Charles Denson. An official site visit was arranged by NYCEDC to get an idea of the building's condition. 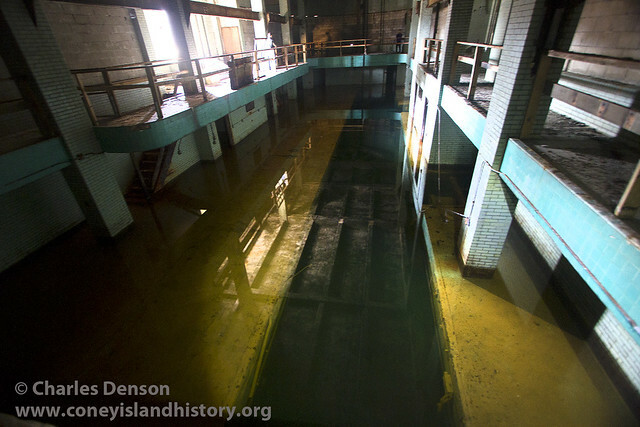 "The pump house has a shimmering reflecting pool, aqua tiles, and brilliant yellow floor," said Charles Denson. "It's doubtful that the lower level can ever be used again when the building is repurposed as it lies below sea level. I can imagine its future as a ferry terminal, ecology center, community center, or museum. It certainly should be landmarked and included in the City's resiliency plans for Coney Island Creek." Due to the weather forecast for Palm Sunday, March 20, Coney Island's Opening Day has been postponed to Saturday, March 26. The Coney Island History Project will not be open on March 20. Instead we will be open on March 26 and 27 from 1:00pm-6:00pm. March 26 will be the official opening day for Coney Island's rides and attractions. The celebration starts at 11:00AM on the Boardwalk with the annual tradition of the Blessing of the Rides at Deno's Wonder Wheel Park. This year's ceremony is dedicated to Pastor Debbe Santiago of Coney Island's Salt and Sea Mission, who originated the event with Denos D. Vourderis 31 years ago and passed away last month. Deno's Wonder Wheel is marking its 96th season with a free ride for the first 96 riders. At the Cyclone, where the first 100 on line ride for free, the annual Egg Cream Christening of the roller coaster's front car is at 11:45AM. 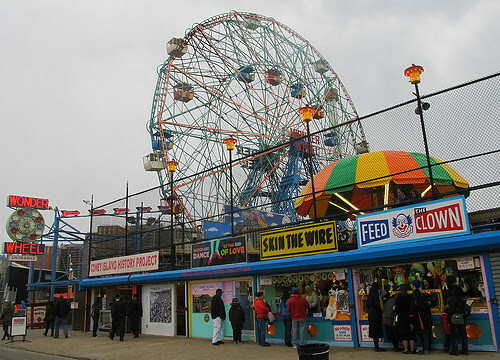 The 1920 Wonder Wheel and the 1927 Cyclone are official New York City landmarks. You're invited to visit the Coney Island History Project's exhibition center from 1:00-6:00PM on March 26th. View historic artifacts, photographs, maps, ephemera and films of Coney Island's colorful past. Admission is FREE. Our first special exhibit of the 2016 season, opening on Memorial Day Weekend, will be "The 50th Anniversary of Fred Trump's Demolition of the Steeplechase Pavilion." A half century ago Coney's most beautiful and imposing structure was demolished by developer Fred Trump, Donald Trump's father. This exhibit examines in photos, ephemera, and oral history, the importance of the pavilion and the memories of local personalities who dealt with Trump before and after the tragic demolition of a Coney Island landmark. During the last decade History Project director Charles Denson interviewed many of the players involved in the loss of Steeplechase and the exhibit reveals many little known facts. 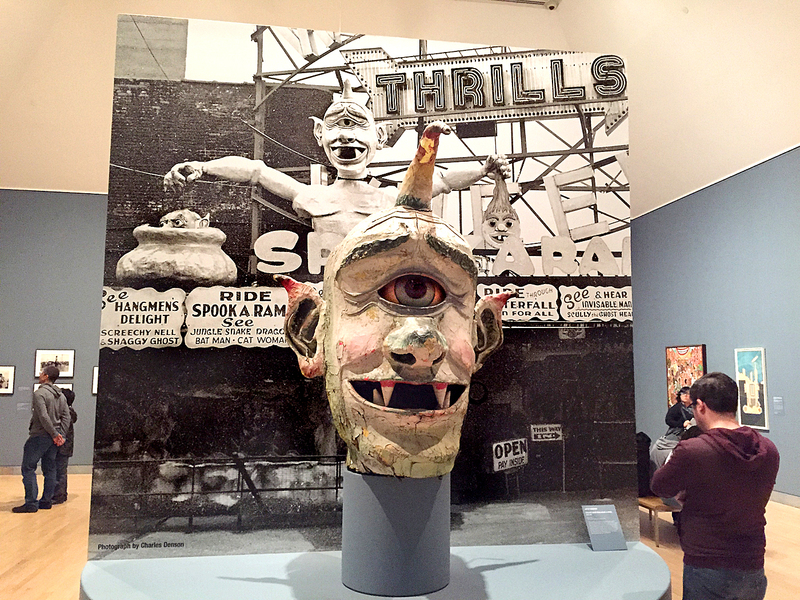 On Easter Weekend at the Coney Island History Project, visitors may take free souvenir photos with an original Steeplechase horse from the legendary ride that gave Steeplechase Park its name and "Skully," a figure from Coney Island's classic Spookhouse and Spook-A-Rama dark rides. Among the treasures on display at the Coney Island History Project's exhibit center this season is Coney Island's oldest surviving artifact. 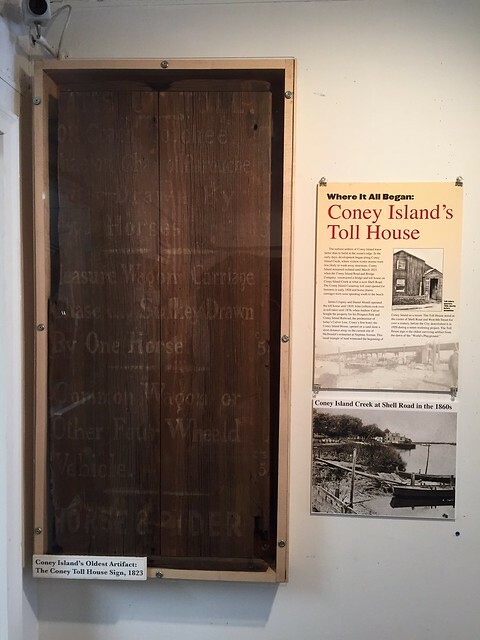 The 1823 wooden Toll House sign dates back to the days when the toll for a horse and rider to "the Island" was 5 cents! The current special exhibit on view is "Coney Island Stereoviews: Seeing Double at the Seashore, 1860-1920." Located on West 12th Street at the entrance to Deno's Wonder Wheel Park, just a few steps off the Boardwalk, the Coney Island History Project is open free of charge on weekends and holidays from Memorial Day Weekend through Labor Day from 1-7pm, We will also be open on March 27, Easter Sunday, from 1-6pm. 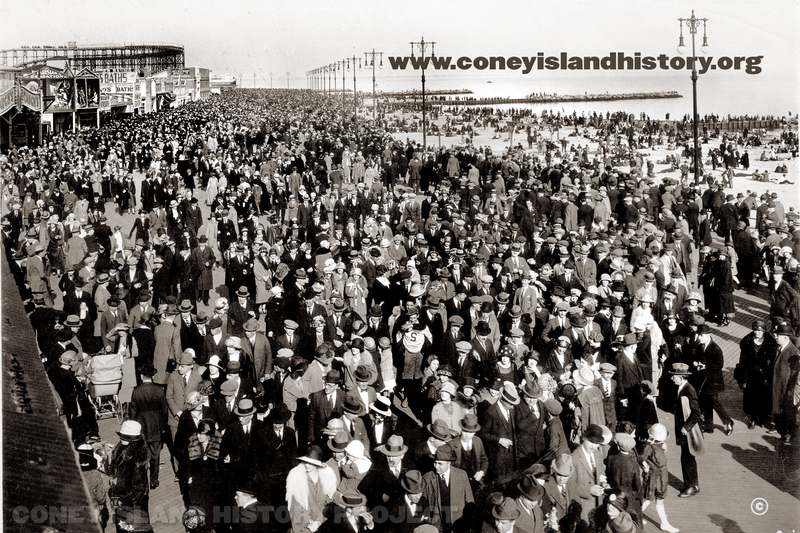 The Coney Island History Project is open year round for private group visits and our weekend walking tours. Jimmy McCullough, former owner of the B&B Carousell, poses with his wife and daughters in front of the historic ride before its sale to the City in 2005. Photo © Charles Denson. Last week, Senator Kirsten Gillibrand announced the good news that Coney Island's B&B Carousell was officially added to the National Register of Historic Places. In January, Gillibrand wrote to the National Park Service explaining that although the current location at Steeplechase Plaza is new, the site was formerly Steeplechase Park and is historically symbolic and appropriate. 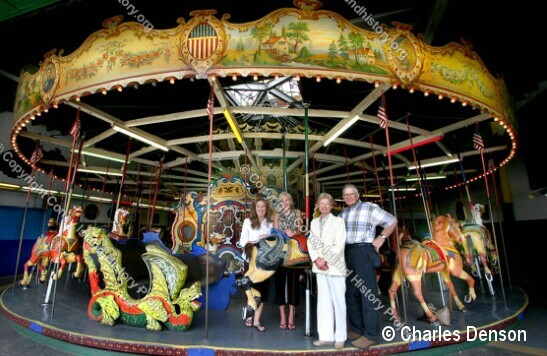 History owes a debt of gratitude to Bishoff and Brienstein, the carousel's namesakes, who brought the ride back from New Jersey in 1932, and Jimmy McCullough who bought it from his cousin Willy Bishoff in 1973, and his partner Mike Saltzstein, who kept the carousel spinning year-round on Surf Avenue until his death in 2001. 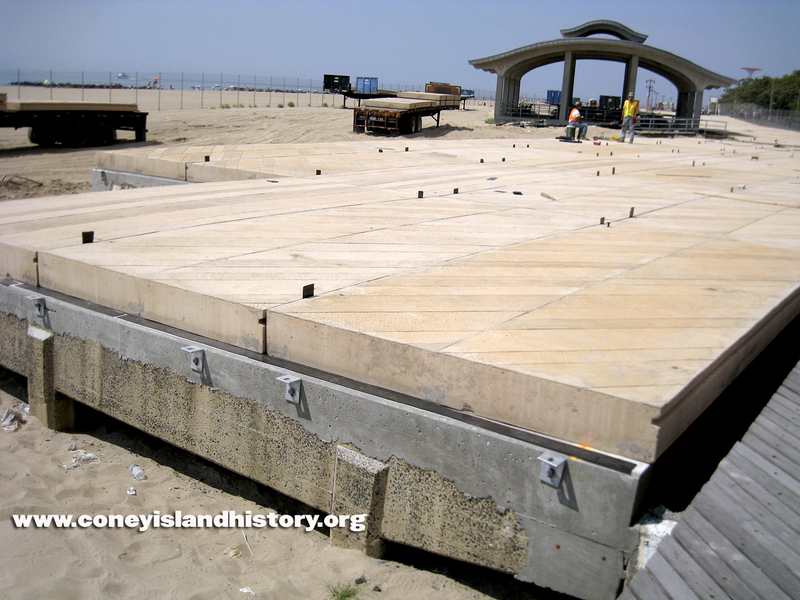 In this 2009 interview for the Coney Island History Project's Oral History Archive, Charles Denson talks with Jimmy McCullough, who passed away in 2013. Jimmy McCullough learned the carousel business from his father, James McCullough, who began his career working on the Steeplechase and Stubbman carousels. Working in Coney Island was a family business going back generations for Jimmy who was a descendent of both the Tilyou and the Stubbman families. Jimmy and his family owned and operated numerous small amusement parks and carousels in Coney Island, including the historic carousels that are now in Prospect Park and Flushing Meadows Park, as well as Coney's B&B. Built in 1919 at the Coney Island factory of William Mangels, the B&B Carousell was the last remaining ride on the north side of Surf Avenue and the last of Coney Island's historic carousels when it was acquired by New York City in 2005. The resplendently restored carousel was installed in a new pavilion next to the Parachute Jump in Steeplechase Plaza in 2013. Coney Island Council Member Mark Treyger and Brighton Council Member Chaim Deutsch have introduced a resolution to designate Coney Island's iconic Riegelmann Boardwalk a scenic landmark. The resolution calls on the City's Landmarks Preservation Commission to recognize the structure as one of the City's historic landmarks. Co-sponsors included 49 other council members and the City's Public Advocate, giving the resolution nearly unanimous support. In recent years the Boardwalk has been allowed to deteriorate and some of it has been replaced with a concrete surface turning the famed Boardwalk into an ugly sidewalk. Treyger, with the help of Coney Island History Project Director Charles Denson, originally filed an application with the LPC to landmark the Boardwalk on December 2nd, 2014. Treyger, Denson, and neighboring Council Member Deutsch met with Landmarks Preservation Commission officials last year urging them to consider the historical context under which the Boardwalk was built. "The Boardwalk is one of our community’s most precious assets," said Council Member Treyger. "For nearly a century, the Boardwalk’s 2.7 mile span has welcomed millions of people, locals and tourists alike. Whether it is parents pushing strollers, seniors socializing, joggers exercising, sightseers photographing, or even couples taking romantic walks along its classic wooden planks, the Boardwalk is and has been a cultural and social touchstone for all residents of Southern Brooklyn, as well as its global audience. "This beloved local treasure deserves official status so that its defining structural and aesthetic characteristics are preserved and protected. The landmarking process in the city must take into account all the city’s neighborhoods. Landmarking across the city needs to be an equitable process, because Southern Brooklyn has a cultural and historic tradition, too. We have already lost notable historic structures in our community to development because of our city’s sluggish landmarking system. We must ensure that what remains of our area’s past stays intact." The resolution was also supported by Borough President Eric L. Adams, Assembly Member Pamela Harris, Comptroller Scott M. Stringer, Senator Diane Savino, and Congressman Hakeem Jeffries who added: "The Riegelmann Boardwalk is an indelible part of New York City’s history and of the Coney Island community. Those classic wooden planks have witnessed New York legends ranging from Fiorello La Guardia and John Lindsay to David Dinkins – as well as millions from around the world who came to visit the greatest city in the world. Replacing them now would be akin to knocking down the Empire State or Chrysler Building. We cannot allow this treasured part of New York to be wiped away. Council Member Treyger and all involved should be commended for their leadership in this effort." There are two other scenic landmarks in Brooklyn: Ocean Parkway and Eastern Parkway. The Riegelmann Boardwalk meets the same criteria for landmark status as these parkways and the time has come to recognize and protect the Boardwalk and its legacy before it is too late.